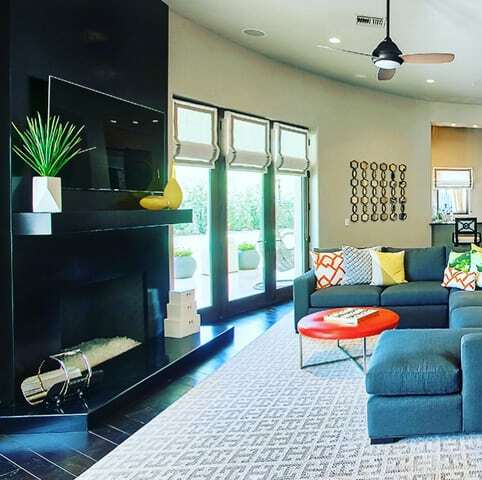 Recently I completed a remodel for a longtime client of mine, where the challenge was to refresh and update their 10 year old Paradise Valley home by blending old with new and transforming traditional to modern. I met the client through the builder I was working with when they decided to purchase the home in 2008. 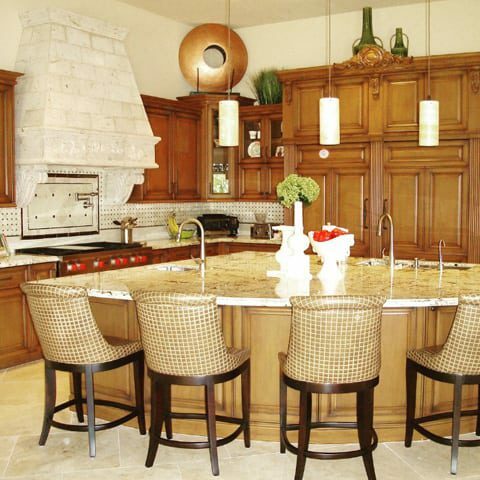 The home was originally designed with a traditional, Tuscan style feel dictated by the builder because of the popularity of that style at the time. 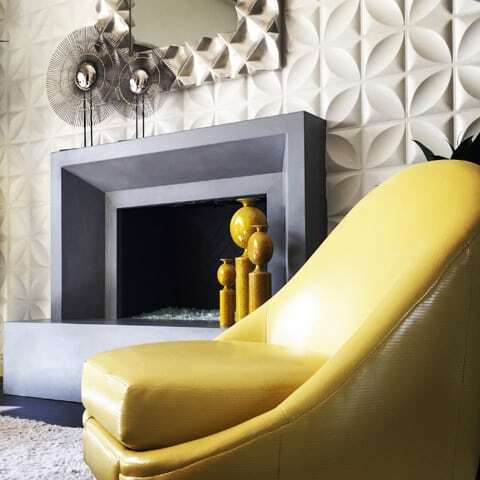 Over the years, this young family found that the formal, ornate style of the house didn’t match their personal style or how they lived in the home. Thinking back to when the property was originally under construction, I remember suggesting to the builder and his real estate advisor that he should consider changing the kitchen cabinetry to white instead of the same brown stained alder he used in all of his previous home builds. My recommendation was dismissed, but 10 years later this home got the beautiful white on white kitchen I had always envisioned. The existing cabinetry was refurbished with a fresh coat of white paint, new doors, trim moulding and hardware. 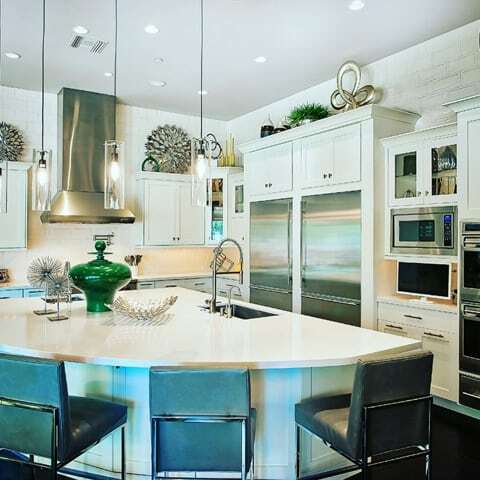 Crisp, white Caesarstone quartz replaced the dated granite countertops. 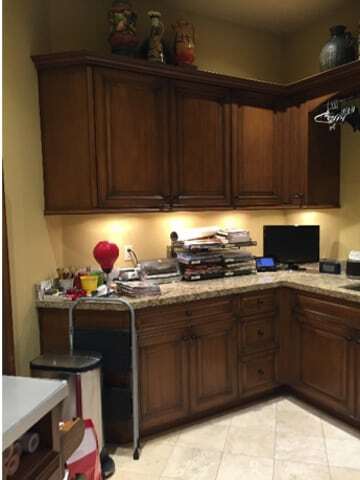 Oversized, dimensional glazed white subway tile replaced the gold and brown marble backsplash. The transformation of the home started about 7 years ago with the repurposing an underutilized Guest Suite into a functional Teen Room space for the family’s three children. We opened the wall between the old bedroom and game room and added barn doors for better flow, function and more open feel. I assisted in transforming additional spaces, such as the backyard Casita from a triathlon training gym for dad, to a dance studio for their daughter and finally to a boxing gym for their oldest son. 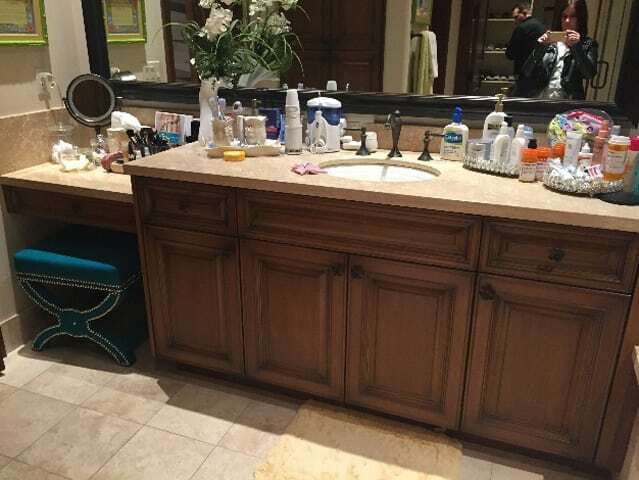 Over the years we have updated each of the kid’s bedrooms and bathrooms to reflect their personalities and interests as they grew from children into teenagers. 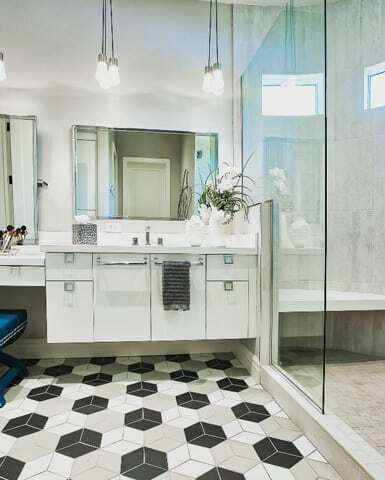 For their daughter’s updated bathroom, a modern geometric patterned floor tile in a classic black, white and grey color scheme is personalized with a splash of her favorite color: teal. The most recent phase of remodeling work included new lighting fixtures, fresh paint colors, and flooring throughout the home. 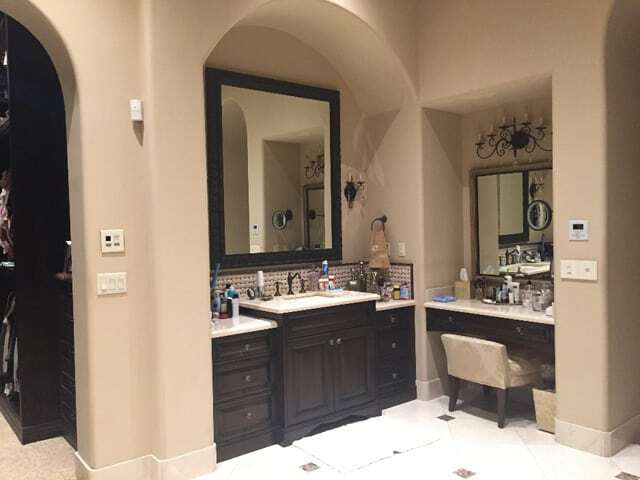 A mix of hardwood, white marble, and modern porcelain tile replaced the dated travertine floors. 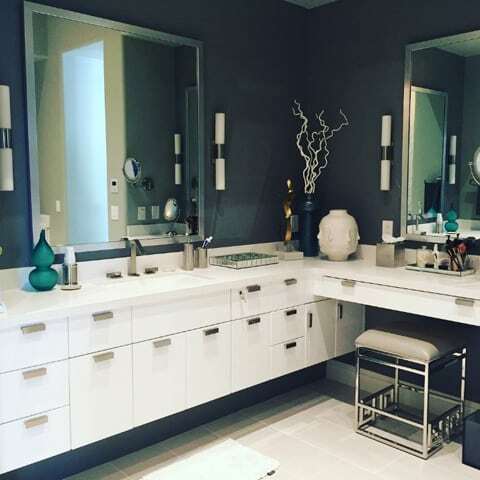 In the Master Bath, dark wood cabinetry changed to white lacquered floating style vanities with contemporary fixtures. 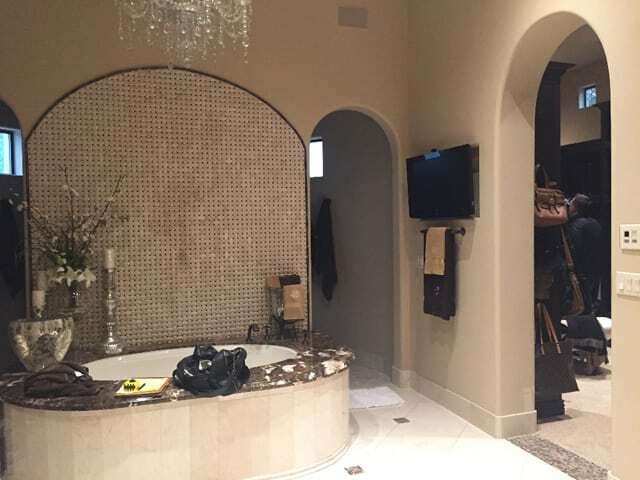 The bulky, dark marble tub surround was deleted, and a new freestanding tub gives the space an airy, spa-like feel. 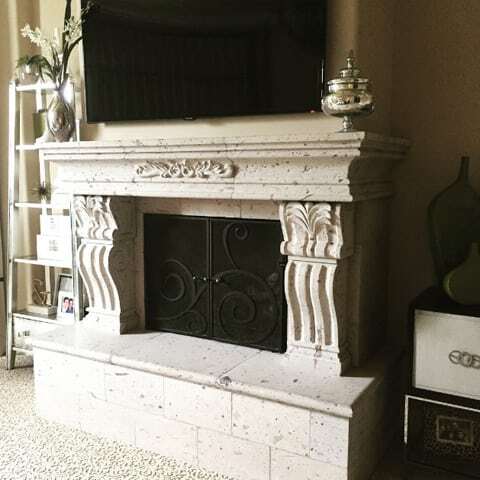 Clean, modern custom-fabricated concrete and steel fireplace surrounds replaced the ornately carved cantera stone. 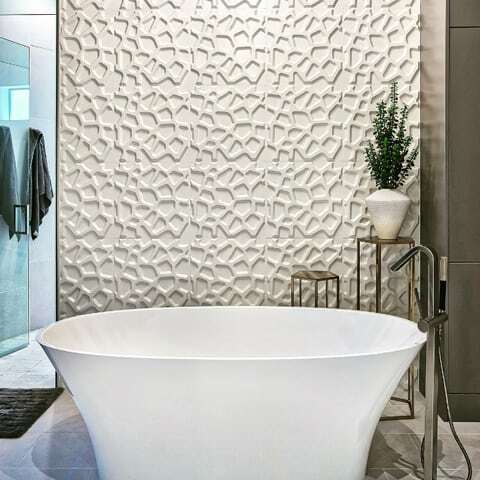 Visual impact has been created throughout the home with the application of wallpaper, accent paint treatments and dimensional wall tiles. 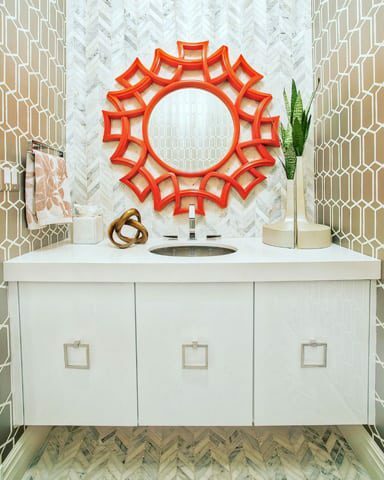 Even the laundry room got a face lift with some boldly patterned wallpaper. 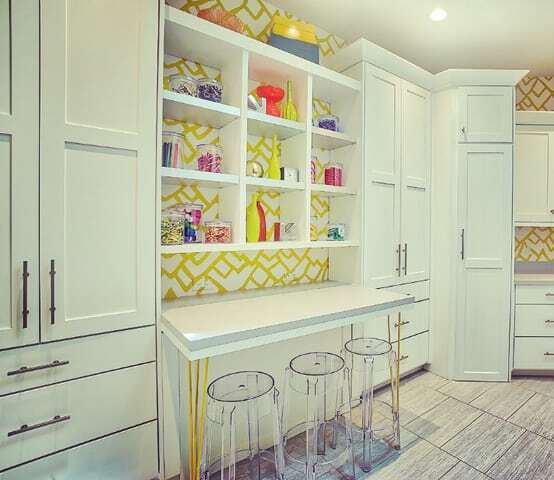 I personally draw a lot of inspiration from Mid Century modern design, so I love when I’m able to incorporate touches of it in my projects like these mod yellow hairpin style legs on the Laundry Room craft table. 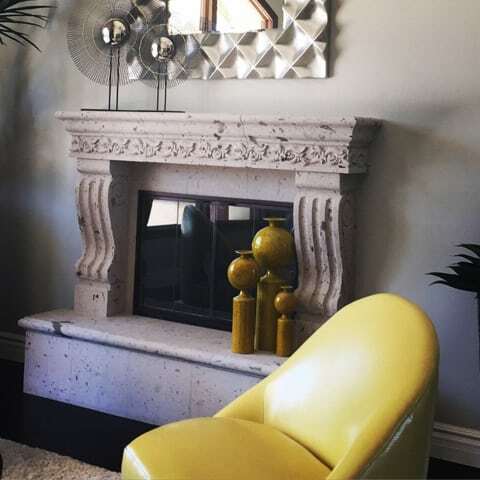 The addition of bright pops of color through furnishings, artwork and accessories gives the home a more vibrant, casual feel better suited to this vibrant family of five. It’s hard to believe I’ve been working with them for over a decade now! I love getting to know my clients and collaborating with them to make their homes both beautiful and functional for their lifestyle. 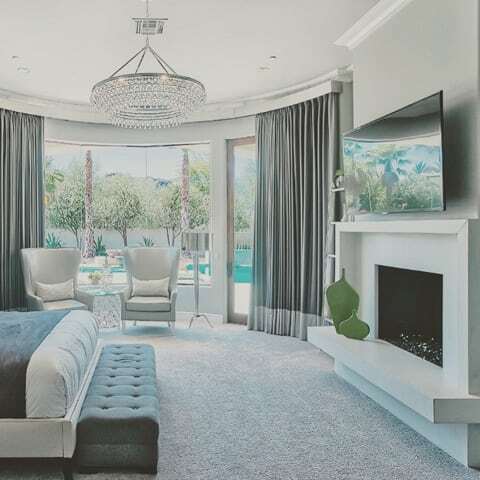 I’m eagerly anticipating the opportunity to help them design for the next phase in life as their teenagers become adults and leave this stylish nest we’ve created.